Gorilla Scheduling Software vs StudioBinder: Which is Better? Read our Gorilla Software review below. ﻿﻿﻿﻿﻿﻿﻿﻿StudioBinder is easier than ﻿Gorilla﻿ Software. Tired of having to struggle your way through clunky designs and convoluted menus? We’re not sure why simple actions require 9+ clicks in Gorilla Scheduling (Jungle Software). With StudioBinder, the experience is streamlined, modern and intuitive. No training required. You’ll also get more features than Gorilla Scheduling to better manage productions — contacts, messaging talent & crew, stripboards, shooting schedules, breakdown sheets, call sheets, file sharing, all without having to navigate a maze of features you don’t need. Actually saves time as you use it. StudioBinder’s intuitive film producing software not only requires less training to get started. It also means you can get the job done faster and wrap earlier every day. When film production software is complicated, it adds hours of wasted time to ramp up and use. Multiply that by each team member…that’s a lot of lost productivity. Get more done by working ﻿﻿﻿﻿﻿﻿﻿﻿as a team, all in sync. 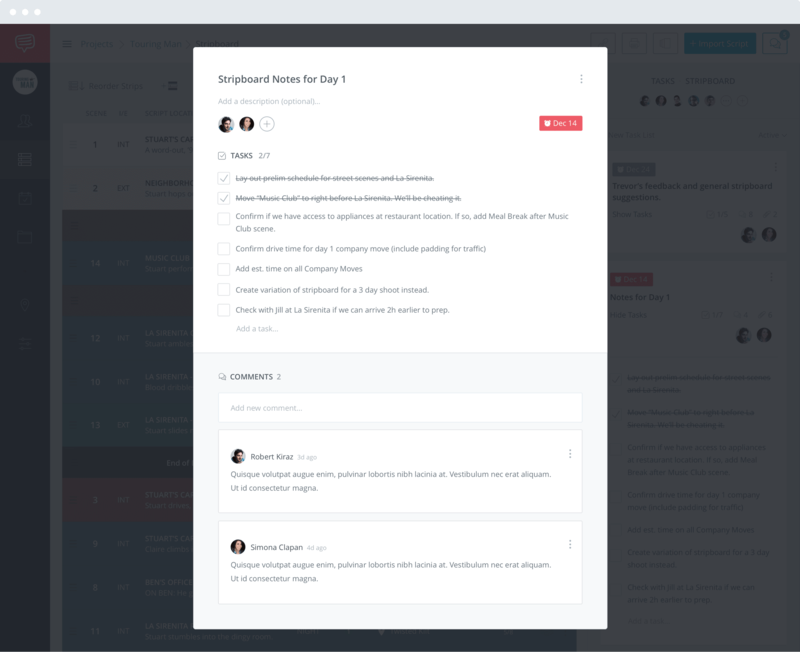 With StudioBinder, you can easily invite team members to help you manage your projects. It doesn’t matter if they’re in-house or remote, they can get started in seconds. Unlike desktop film production software like Gorilla Scheduling, StudioBinder is a cloud solution. This means zero software installation. No 500mb+ installation files. No Java runtime updates. And everyone stays in sync. ﻿﻿﻿﻿﻿﻿﻿﻿Share pages with clients and collaborators. Another benefit of cloud-based film production software: you can share individual pages with collaborators, and engage online. A “collaborator” can be a client, executive, crew member, anyone. Share shooting schedules, breakdowns, prelim call sheets, contact details and more. Because Gorilla Scheduling is requires heavy desktop installations (and must purchase a new license for every user), it’s simply not realistic to collaborate with clients or crew who need limited access. We don’t think collaboration should be punished. Share pages with as many collaborators as you like, your price will stay the same. Assign Tasks. Make sure progress is made. 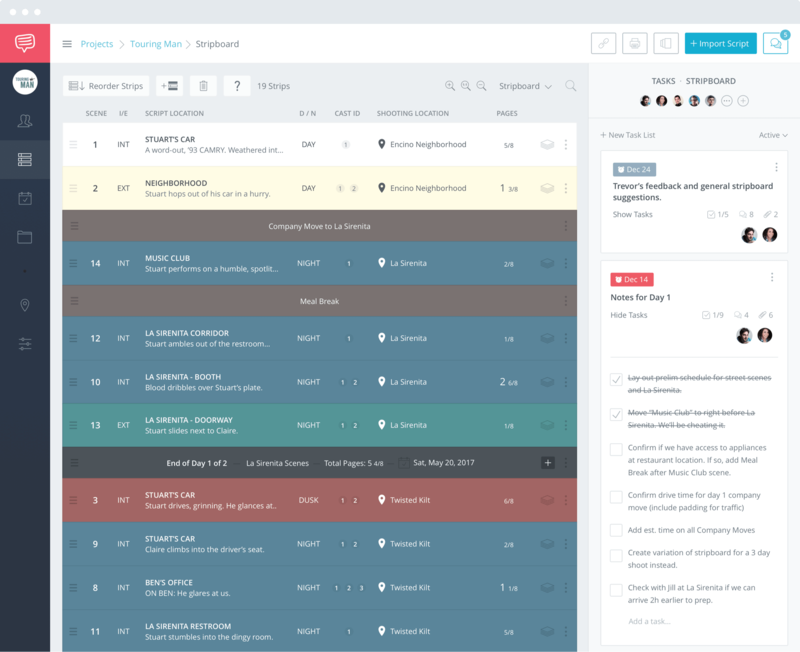 StudioBinder bridges the divide between film scheduling software with film project management. Assign mission critical to-do tasks to collaborators or team members. Effortlessly stay on top of your team’s progress. Multiple solutions under one roof. …to post-production file sharing and document management. Intuitive select-and-tag interface makes adding elements a breeze. Gorilla Scheduling is focused solely on the film scheduling, and requires additional Gorilla software installations. For example, if you want to transition from Gorilla Scheduling to their call sheet solution, Koala Call Sheets, you must buy a license, download and install the new software, and then play the export/import game. Since StudioBinder is all-one-solution cloud solution, all of our functionality seamlessly weaves together. For example, if you want to create a call sheet with the scenes in your shooting schedule, just go to your Stripboard page and click one button. After that all the data will be automatically added to a new call sheet. No fuss. Join 20,000 production companies and video agencies that are optimizing their production workflows. Gorilla Software is more expensive. Paying up front for expensive scheduling software is a dated notion, especially if you find yourself unhappy with the solution. StudioBinder offers a “free forever” plan so you can test drive most of its functionality. Pay monthly. Upgrade or downgrade as you like. Importing a script into Gorilla Software is a surprisngly slow process. It could take minutes to import a script and parse its data. It shouldn’t. This indicates serious quality concerns under the hood. Importing and parsing a 200 scene Final Draft script into StudioBinder literally takes 1 second. Don’t believe us? Watch our import workflow below. Gorilla Software is built on the FileMaker platform, which was created in the 1980’s for non-developers to build inventory apps. StudioBinder is a custom solution built using the same technologies used by Google. As a result, pages and features load fast; near instantaneous. Faster load times not only indicate more reliable engineering. It saves the aggravation of waiting around for things to load throughout the day. You’re paying for this wait time. The time savings from faster performance quickly adds up to hours a week, days a month. 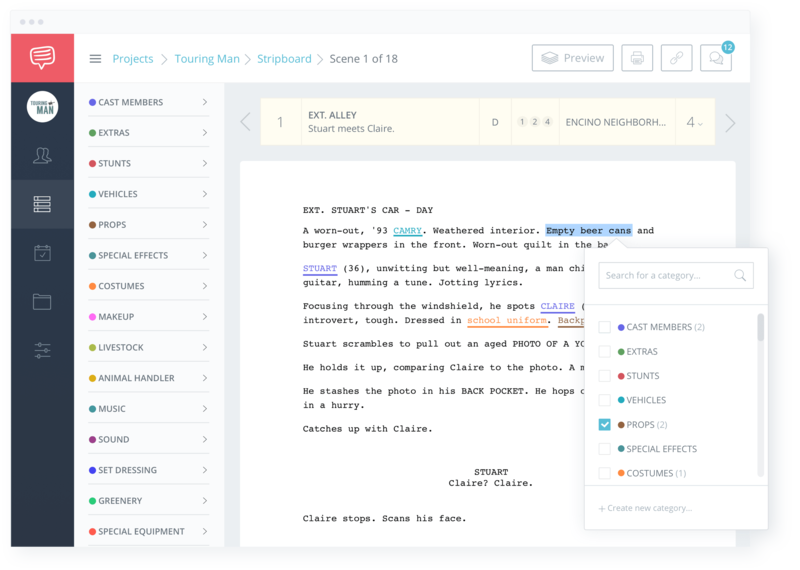 Everything your company needs to better manage productions. No, StudioBinder is a modern, fully cloud-based solution! This allows you to access your data from anywhere and invite team members without installing cumbersome desktop software. StudioBinder’s pricing is based on features and how many team members you invite. We offer monthly and (discounted) annual plans. Not at this point as heavy typing is not ideal for mobile devices. However many of our shared pages are mobile-responsive for viewing convenience. which means recipients of call sheets and certain shared pages will see a page that displays nicely on mobile devices. Yes! StudioBinder automatically detects user IPs and supports celsius, 24-hour clocks, and international phone numbers. Why StudioBinder is the best Gorilla Software alternative. The short version? StudioBinder is better for companies looking for a more collaborative, all-in-one solution. Gorilla Scheduling is better if you want a more siloed desktop solution.